It was 72 years ago today that a picket line formed outside the Disney Studios in Burbank, and hundreds of artist went out on strike. It was Day One of what would ultimately be the largest (and most dramatic) strike in Hollywood history. The strike came as no surprise to Walt –who had even anticipated it in his daily planner — but the impact it had on his studio and his own psyche was completely unforeseen. There was a vote on whether animation supervisors could be part of the strike (directors could not). It passed, and Art Babbitt led the way. I sometimes wonder what it would take for a young successful professional to go out on strike. I live in Manhattan, and I’ve seen my share of labor discord. 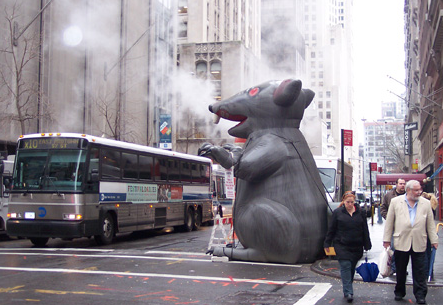 It seems like every other week I encounter a big inflatable Union Rat propped outside a building that has been accused of hiring non-union labor. There seems to be a labor organization for every nearly worker in New York – from the lady who serves you food to the guy who holds the door for you. Not so for the city’s entertainment industry. This became alarmingly true when friends of mine at Viacom (MTV and Nickeldeon) went out on strike in the middle of Times Square in 2007. Or when my previous employer, Little Airplane Productions, came under fire with the musicians union for negotiating in bad faith in late 2008. It left us to wonder, shouldn’t a cartoon show about music take better care of its musicians? Animation in New York is notoriously sans any type of organized labor. It wasn’t always so – animation writer Allan Neuwirth used to head the New York branch of the Animation Guild, at least until the mid-90s. It disbanded, the argument goes, because the restrictions of hiring union employees was putting too much of a strain on the already floundering east-coast industry. Not so in Hollywood. Ever since the Disney Strike ended in September 1941, the region has been a union town for animators. With steady projects in film, TV and commercials, a union strengthened the employees’ stance against the employers. Following the rules gets you job security and better working conditions. No animation job I ever worked included overtime of any sort. Like the animators of Snow White, when we had deadlines to meet, we stayed until it got done without any additional pay. One job was generous enough to offer comp time. For another gig, the best we could hope for after 6 o’clock rolled around was a comp dinner. Mathematically, that equaled to about $2.50 and hour, and the regularity of this was expectation was alarming. We discovered that the entire production schedule depended on free late nights. I remember one boss grabbing his coat to leave, smiling with an air of self-satisfaction, as dozens of us stayed at our desks and toiled away. There has got to be a balance of power. No one wants to be taken advantage of, but human nature dictates that scruples take a back seat to basic greed. Was Walt Disney greedy? Not compared to other company execs today who take full advantage of legislative loopholes. But Walt was trying to run his company not through collective bargaining, but on the whim of his own personality. That in itself is a recipe for conflict. This entry was posted in 1941: The Disney Strike, Disney, Labor, New York and tagged Disney, Little Airplane, MTV, Nickelodeon, Viacom, Walt Disney. Bookmark the permalink. Hey, Jake! I’m working on a Disney writing project as well, and I wanted to ask you a question or two about Babbittology. I’m at jeffryan1@gmail.com: thanks! Hey Jake, my name is Jacob Boelman. I have read a few of your posts and find them very interesting. I am a huge fan of Walt Disney actually. He is the most inspirational man I have ever studied. I however in no way idolize him. I think he was egotistical and full of faults. I admire your take on him. Art Babbitt and Walt Disney were both very creative people who I believe had their demons. I remember watching the documentary, “The dark side of Walt Disney” (or something titled like that on Youtube; the documentary has since been taken off) and hearing Art Babbitt talk about his involvement in the strike and some of his interactions he had with Walt. Supprisingly enough he talked about going to Walt’s pool parties at his house in the mid 1930’s. Babbitt talked about watching Walt at a party celebrating the release of Snow White. He had someone go give Walt a hard time and Walt right away threatened to fire him. That kind of stuff just wasn’t tolerated by Walt. I think the 1941 Strike was the most tragic event in Walt’s life. It completely changed Walt’s demeanor and was responsible for many great artists, such as Art Babbitt and Bill Tytla, eventual leaving of the studio. Gosh what might of been if that was handled better? Anyway, thanks for the posts and look forward to your biography. I am going into film and one of my dreams is to make a movie about Walt Disney’s life. However, I am pretty positive the Disney Company would never let me make it :/. The Walt Disney in “Saving Mr. Banks” was but a shadow of who I have come to admire and be inspired by. Indeed, Walt Disney is definitely an inspiration to me in terms of animaton influence but at the same time he’s pretty much the opposite of me politically. The more I look at this history, it’s really quite troubling how he acted during this series of events. On one hand it’s understandable that due to the loss of Oswald he was very protective of things produced at the studio, but his sense of control at the studio definitely doesn’t seem like the easiest environment to work for many.